An earthen landfill cover test site, consisted of a 0.9 m thick compacted loess layer underlain by a 0.3 m thick gas distribution layer, was constructed at the Jiangcungou landfill in Xi’an, China. Nine methane emission test points were evenly arranged in the test area, and methane emissions were measured at each test point for approximately 35 days. The atmospheric pressure was recorded by the weather station installed near the test site. During 2015, the atmospheric pressure decreased first and then increased with time, and was basically symmetrical about the middle of the year. 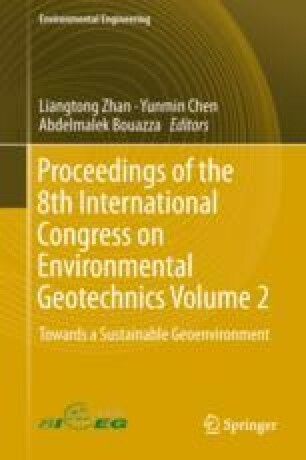 Methane emission from the earthen landfill cover could be directly related to atmospheric pressure changes, and a significantly negative relationship was found between the measured methane emissions and surface atmospheric pressure. An improved understanding of the atmospheric pressure variations and the influence of atmospheric pressure on methane emission from earthen covers are meaningful for developing a methane emission model and for mitigating methane emissions. The authors are very grateful for the financial support of the National Basic Research Program of China (973) via Grant No. 2012CB719805 and the National Natural Science Foundation of China via Grant No. 51625805.